Hey there Dorks of Canberra this is the rest of the program for the year! Featuring Matthew Sleeth, Deborah Kelly and Julianne Pierce. Matthew Sleeth is an Australian artist who lives and works between Melbourne and New York. His multidiscipline practice is conceptually driven across a range of media including sculpture, photography, video and public installation. Matthew has exhibited as part of a number of international events including the Odense Triennial (Denmark), Berlin Photography Festival, Noorderlicht PhotoFestival (Netherlands), the Venice Architecture Biennale, Art Chicago and the Melbourne International Arts Festival. 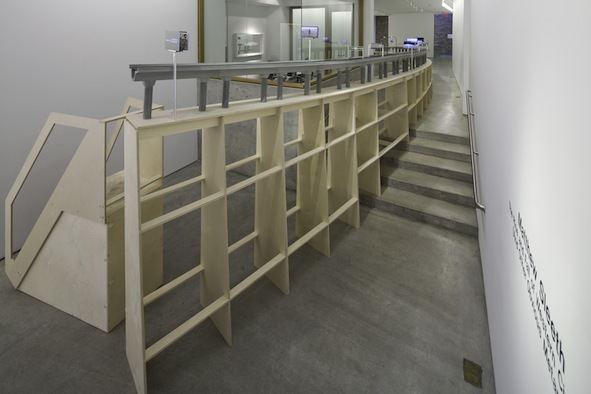 Following his 2009 solo show, Various Positions, his large-scale sculptural exhibition The Rise and Fall of Western Civilization (and Other Obvious Metaphors) opened at Claire Oliver Gallery (New York) in December 2011. In August 2009 he participated in Long Distance Vision at the National Gallery of Victoria (Melbourne) and in 2008 his work was installed across billboards, screens, public spaces and galleries as part of the Melbourne International Arts Festival. He is currently a Ph.D candidate in Media Arts Department at RMIT University, Melbourne. His books include Ten Series/106 Photographs (2007), Opfikon (2004), Survey (2004), home+away (2003), Tour Of Duty (2002), The Bank Book (2001), Roaring Days (1998) and artist books Red China (2005) and Call Of The Wild (2004). Deborah Kelly is a Melbourne-born, Sydney-based artist whose works across media have been shown in streets, skies and galleries around Australia, in the Singapore and Venice Biennales, and elsewhere. Her award-winning collaborative artwork with Tina Fiveash, Hey, hetero! has been shown in public sites from Sydney to Glasgow, and is taught in universities from Winnipeg to Hong Kong. She is a founding member of the art gang boat-people.org, which has been making public work around race, nation, borders and history since 2001. Her cross-media work considering the rise of religiosity in the public sphere, commissioned by the Museum of Contemporary Art, included public service announcement videos in train stations and projections onto clouds over Sydney Harbour. The participatory memorial she devised for the 20th anniversary of the Tiananmen Square massacre was performed in 20 cities and towns around the world on 4 June 2009. Most recently, her 2012 commission for GOMA in Brisbane comprises 37 contemporary portraits modelled on Renaissance Holy Family imagery. Her work won the 2009 Fisher’s Ghost Award, the 2009 Screengrab International New Media Art Award, and the 2012 Albury Art Prize. Artspace will publish a monograph about her work late in 2012. In her talk, she will attempt to recruit you. There will be presents. Latest statistics reveal that Australians are a nation of Internet daters. With 52% of women and 45% of men trawling the Internet to find their perfect match. The holy grail of dating sites RSVP, claims that 48% of single adults have tried it and more than two thirds of adults in NSW know someone who has met their current partner through online dating. So why are we turning to the Internet to find a mate? What has happened to the old finished methods of flirting and fumbling after a night out at a bar? Why are our beer goggles so firmly focused on our iPhones and iPads and not staring blearily at a potential squeeze across a crowded dance floor? In this thought provoking session, aficionado of Internet dating Julianne Pierce will reveal some of the facts and fictions of Internet dating. Can a computer programme really help us to find true love? Should you lie about your age online and use a profile photograph that is 10 years old? When should you go on your first date and how do you make a hasty exit if Mr or Ms right turns out to be Mr or Ms wrong? Whether you are happily married, just divorced or a confirmed bachelor or bachelorette, you will be fascinated by this foray into love and where to find it in the 21st Century. Julianne Pierce is a producer, writer and performer. Her alter ego Madame Ivana is a well-known matchmaker and fortuneteller who travels the world in pursuit of romance, excitement and the perfect oyster.